Objectives To provide an overview of the evidence base on the effectiveness of workforce interventions for improving the outcomes for older people with cancer, as well as analysing key features of the workforce associated with those improvements. Methods Relevant databases were searched for primary research, published in English, reporting on older people and cancer and the outcomes of interventions to improve workforce knowledge, attitudes or skills; involving a change in workforce composition and/or skill mix; and/or requiring significant workforce reconfiguration or new roles. Studies were also sought on associations between the composition and characteristics of the cancer care workforce and older people's outcomes. A narrative synthesis was conducted and supported by tabulation of key study data. Results Studies (n=24) included 4555 patients aged 60+ from targeted cancer screening to end of life care. Interventions were diverse and two-thirds of the studies were assessed as low quality. Only two studies directly targeted workforce knowledge and skills and only two studies addressed the nature of workforce features related to improved outcomes. Interventions focused on discrete groups of older people with specific needs offering guidance or psychological support were more effective than those broadly targeting survival outcomes. Advanced Practice Nursing roles, voluntary support roles and the involvement of geriatric teams provided some evidence of effectiveness. Conclusions An array of workforce interventions focus on improving outcomes for older people with cancer but these are diverse and thinly spread across the cancer journey. Higher quality and larger scale research that focuses on workforce features is now needed to guide developments in this field, and review findings indicate that interventions targeted at specific subgroups of older people with complex needs, and that involve input from advanced practice nurses, geriatric teams and trained volunteers appear most promising. This novel synthesis provides evidence of promising interventions targeted at delivering high-quality care to older people with cancer. It is an international systematic review articulating the evidence base on workforce interventions that may support high-quality cancer care to an expanding ageing population. The review is limited to those studies where the role of the workforce was explicitly articulated within an intervention; there may be other studies in which changes or adaptations to the workforce were tested but not reported and are not included here. The review only included items published in the English language. While the specific role of the healthcare workforce in ensuring optimal outcomes and QOL for older cancer survivors and their families has been recognised, evidence suggests that there are variations internationally in the preparedness of the workforce to meet the needs of an ageing population.9–16 Issues identified include deficits in the necessary education, knowledge, skills and attitudes; in staffing levels and skill mix; and in the development of roles, teams and services that meet older people's needs.17 However, little is known about the features and characteristics of the workforce associated with better outcomes for older people with cancer, or about the relative effectiveness of workforce-focused interventions which are aimed at improving cancer care and outcomes for an ageing population. This systematic review therefore aims to inform developments in policy and practice by providing an overview of the evidence base on the effectiveness of workforce interventions for improving the outcomes for older people with cancer, as well as analysing key features of the workforce associated with those improvements. associations between the composition and characteristics of the cancer care workforce (including, but not limited to, staffing levels, skill mix, training, knowledge attitudes and skill) and outcomes for older people with cancer. Studies reporting solely on drug, treatment or other therapeutic interventions (without specific focus on the workforce delivering those interventions) were not included. PRISMA (Preferred Reporting Items for Systematic Reviews and Meta-Analyses) study selection flow chart. 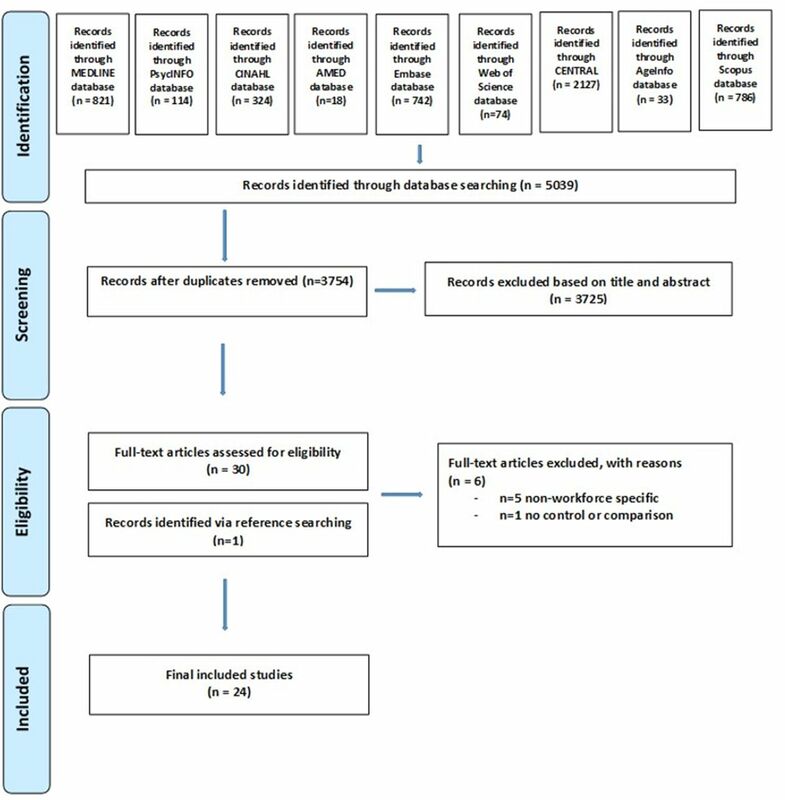 Data on aim, design, setting, sample, intervention, outcome and results were extracted systematically from eligible papers using data extraction tables developed by the team (see online supplementary file 3). We adapted the GRADE (Grading of Recommendations Assessment, Development and Evaluation) system as used by Cochrane for rating evidence18 to guide a broad assessment of individual study quality and thereby the contribution studies made to the review. Initial quality ratings based on study design were upgraded or downgraded depending on presence of factors considered to strengthen or weaken the evidence. Two members of the team independently reviewed all included papers. Discrepancies were discussed and ratings confirmed through discussions involving both raters and a third team member. No studies were excluded based on this assessment but lower quality studies were given less weight in the analysis. Due to the heterogeneity of interventions and outcomes, a narrative analysis of study findings was merited.20 Studies were grouped around the patient or service problems the interventions were targeting. Results were tabulated and the findings of effectiveness of individual interventions were plotted within these groups and used as the basis for an analysis of the strength of evidence of effectiveness across these groups and the field as a whole. We recorded and tabulated both the direction of differences between groups (where reported) and statistical significance of differences. Due to the number of different outcomes across the 24 studies, we report, within the Results section, for the primary outcomes where there is evidence of significant differences between groups, rather than narrating the full set of results for each individual paper. A review protocol is available from the study team on request. We identified 24 eligible published journal papers (23 quantitative and 1 qualitative study) covering 22 interventions and reporting on 4555 patient participants age 60+ from targeted screening, through cancer diagnosis and treatment and beyond. All but one study were conducted in USA or Europe. The studies report on 27 individual primary outcomes and 42 individual secondary outcomes (using a range of measures) across the studies corresponding to 41 different outcomes in total (n=38 of these were patient-related outcomes and the other 3 outcomes were focused directly on the workforce). As detailed below and illustrated in table 2, 17 studies were assessed as low or very low quality, with 4 studies rated as medium and 3 as high quality. The point of the cancer journey each intervention was targeted at varied widely. Interventions ranged from targeted screening stage (n=1) and from diagnosis (n=4); to treatment phase/hospital stay (n=11); to those primarily focused on patients after the completion of their treatment (n=6); hospice care (n=1) or home care for patients with advanced cancer (n=1). The majority of the interventions were limited to specific tumour types: 15 involved participants with a range of cancer types, but some involved more homogeneous populations: 6 were for patients with breast cancer, 1 intervention targeted patients with prostate cancer, another involved those with gastrointestinal cancers and 1 was aimed at breast and cervical screening. Because of the heterogeneity of studies retrieved (and the small number of studies that addressed the review's second objective), we reviewed evidence of the effectiveness of interventions by study type established through particular problems (related to older people with cancer) that the respective interventions were addressing and, subsequently, ways in which workforce requirements were being adapted to meet needs and improve outcomes related to these patient problems. The results in table 2 and set out below are displayed using these individual types. Four studies focused on interventions targeted at the problem of systemic delays or inequitable access to treatment in the cancer journey for older people. They provide some promising evidence that providing additional support to some groups of older patients with cancer can help them navigate the system and access treatment thereby improving the speed and efficacy of care. However, three of these papers provide only low-quality evidence. A high-quality RCT reported that older women with breast cancer in the care of a nurse case manager acting as an educator, counsellor and coordinator were significantly more likely to see a radiation oncologist as part of initial evaluation, and to receive breast-conserving surgery and radiation therapy.27 Further, the difference in receipt of appropriate treatment between women with characteristics associated with lower rates of appropriate treatment (75+, being unmarried, living alone and being a member of an ethnic minority group) and their respective comparison groups were diminished or eliminated in the intervention group. An observational study reported that a breast cancer nurse navigator providing support and coordination of patient care from diagnosis until entry into survivorship clinic significantly shortened time to consultation for patients aged 61+ years.25 A nurse practitioner role was used in a quasiexperimental study to improve screening rates for older Black women of low socioeconomic status by offering screening during a routine visit.35 Nurse practitioner follow-up screening rates were significantly higher than baseline, compared with control group follow-up rates. A further study assessed the impact of a geriatrician consultation and treatment plan through an analysis of registry data of older patients with breast cancer.32 Patients who had a consultation had more comorbidities and more advanced and aggressive tumours, were more likely to receive mastectomy and adjuvant therapy, and were less likely to be treated by breast-conserving surgery and adjuvant therapy. Other lower quality studies in this group included evaluations of face-to-face counselling to address nutritional intake for patients treated with chemotherapy and at risk of malnutrition,34 an intervention focused on the prevention of postoperative delirium with input from a geriatric team30 and comprehensive geriatric assessment (CGA) targeted at chemotherapy tolerance and toxicity.44 The observational study evaluating CGA for older chemotherapy patients found that CGA patients were more likely to complete cancer treatment as planned but no significant differences were found in relation to mortality or other outcome measures in relation to the interventions in any of these three studies. The five studies reported here target the health issues that may accompany a cancer diagnosis, but also broader health problems that may not directly relate to the cancer. They highlight the importance of recognising and addressing these needs, although the range of outcomes and the variable quality of evidence (three studies of medium quality; two were low quality) make it difficult to draw firm conclusions about the best use of workforce support in this sizeable area. Eight studies focused on addressing QOL across its physical and psychological aspects. This group of interventions used a range of workforce members (often in therapeutic or supportive roles) from physiotherapists to APN to trained voluntary input, to address a range of factors underpinning QOL. They showed mixed evidence of effectiveness. Seven of the studies in this group provided low-quality evidence. Two similar interventions involved a multidisciplinary team approach for a range of QOL domains; however, both of these secondary analyses reported on very small sample sizes of older adults within wider QOL interventions. Lapid et al 42 found in a secondary analysis of a small sample of patients in a wider RCT, that higher QOL scores were reported for older patients who received multidisciplinary emotional and practical support. However, in the study by Chock et al,40 the authors did not find any lasting differences on QOL for older intervention participants against their younger counterparts, apart from an improvement in anger-hostility. APNs were used in a symptom management intervention in the two pilot RCTs and the observational study reported by Heidrich et al. 38 Some evidence of effectiveness was reported for improving self-care and reducing symptom distress and duration, but there was no impact on QOL. Two studies used trained volunteers to bolster psychological support. A secondary analysis of RCT data was used to evaluate the effect of using trained graduate support workers to provide initial distress monitoring to patients over the telephone.28 Intervention patients had significantly lower anxiety and depression at 6 months than patients receiving educational materials alone. However, no other differences in psychological well-being were detected. Mantovani et al 29 also used trained support volunteers to provide emotional and practical support. An RCT with small sample size was used to compare this support with pharmacological treatment alone, and further with the addition of psychotherapy. Significant improvements in anxiety and depression were reported for the groups receiving voluntary support and/or additional psychotherapy. However, there were no significant differences on other QOL measures. Three studies focused on addressing the communication needs of older people with cancer. One high-quality study offered communication skills training to staff with varied success21 and the other two low-quality studies highlighted the importance of good communication as a prerequisite for cancer nurses related to improving older patients’ QOL. This systematic review aimed to provide an overview of the evidence base on the effectiveness of workforce interventions for improving the outcomes for older people with cancer, as well as analysing key features of the workforce associated with those improvements. Findings reflect a range of ways in which the workforce has been adapted, expanded or trained to addressing older patients with cancer multiple and divergent needs. The findings present a novel synthesis of the type of interventions being developed globally to address the broad question of how the workforce can support the improvement of older people's cancer outcomes. The approaches and the patient problems they are addressing are varied, including integrating the input of geriatric specialists into cancer services, using APN roles to support patients, creating new roles to guide patients through the healthcare system and ensuring effective treatment, through to novel approaches using voluntary support, or trialling yoga or other exercise to improve older patients’ QOL. While the included studies begin to provide evidence about how the workforce can be used to make a tangible difference to physical and psychological outcomes of older patients with cancer, the diversity of interventions in the studies reviewed and the range of outcomes evaluated limit generalisations on effectiveness. Further, the quality of evidence is generally low. Experimental designs were not consistently used and, when they were, their implementation was often hampered by poorer than expected recruitment, or conclusions drawn about outcomes for older patients were drawn from a secondary analysis of a wider data set. In addition, as is common in the reporting of complex intervention evaluations, details of the intervention itself were often lacking.45 There was inadequate reporting of the specific workforce contribution to the interventions and limited evidence to address the second objective of the review around the features of the cancer care workforce associated with better outcomes. In addition, while staff training was involved in half of the interventions reported, the details of how that training worked or could be improved were not detailed. Furthermore, although some innovative roles were set up, the rationale and detail of those roles were often poorly reported. Despite these shortcomings, these findings do provide some promising insights into how the workforce may address the varied needs of older patients with cancer, although with a dearth of evidence at the earlier and later stages of the cancer journey. Evidence has suggested that not all older people with cancer need the same input, and indeed age-related changes occur at different rates in different individuals and are not reflected in chronological age.7 Therefore, it is more productive to focus attention on those with complex problems.46 The studies in this review appear to support the notion of targeted assistance to groups at particular risk of undertreatment. Review findings suggest that broader interventions aiming to improve survival outcomes are less successful, but studies did indicate the kind of support that could be put in place after treatment to deal with the specific complications and problems that older people might face. One intervention which did improve survival used APN in home care support postsurgery.37 Indeed, the role of APN in the future of older people's cancer care has been acknowledged elsewhere in the literature,47–50 and this review indicates that this is a candidate role for exploration and further consideration. This review alone is insufficient to enable conclusions to be drawn about the workforce factors which prove most beneficial to older people's outcomes; further high-quality RCTs are needed to assess the potential of possible interventions. Future research should build on the studies reviewed here to establish what workforce developments are needed to support this growing population throughout the cancer journey. The most promising interventions for further study target assistance to individuals with complex needs who are at particular risk of undertreatment, and of problems arising from cancer treatment or its impact. Our review indicates that the impact of multiprofessional teams, including geriatric physicians and APN, on patient outcomes from survival to QOL, would be worthwhile to evaluate more definitively, as would the contribution of trained volunteers. International Society of Geriatric Oncology. SIOG 10 priorities Initiative: SIOG, 2011. http://www.siog.org/content/siog-10-priorities-initiative (accessed 24 Mar 2017).
. Care of older people living with Cancer: the role of the specialist nurse and alied health profesionals. Cancer Forum 2013;37:226–9. Expert Reference Group for the Older Person with Cancer. Older people living with cancer: designing the future health care workforce: Macmillan Cancer Support, 2016. http://sogweb-prod.neox24.ch/files/public/workforce-report.pdf (accessed 24 Mar 2017). Independent Cancer Taskforce. Achieving world-class Cancer outcomes. A strategy for England 2015-2020. 2015 https://www.cancerresearchuk.org/sites/default/files/achieving_world-class_cancer_outcomes_-_a_strategy_for_england_2015-2020.pdf (accessed 24 Mar 2017).
. Education in Europe: are Cancer nurses ready for the future? J Buon 2006;11:281–4.
. Building a Comprehensive Educational Model for nurse practitioner students in Geriatric Oncology. J Am Geriatrics Soc 2016;64:S180–S80.
. Preparedness of UK workforce to deliver Cancer care to older people: summary report from a scoping review. University of Southampton. 2016 http://eprints.soton.ac.uk/401192/ (accessed 24 Mar 2017).
. Guidance on the conduct of narrative synthesis in systematic reviews. A product from the ESRC methods programme version 1: ESRC. 2006.
. A specialized home care intervention improves survival among older post-surgical Cancer patients. J Am Geriatr Soc 2000;48:1707–13.
. Reduced utilisation of specialist care among elderly Cancer patients: a randomised study of a primary healthcare intervention. Eur J Cancer 2001;37:2161–8.
. Advanced practice nurses lengthen survival of elderly Cancer patients. Rep Med Guidel Outcomes Res 2001;12:5–7.
. Geriatric assessment. the role of the specialist nurse practitioner. Asia-Pacific Journal of Clinical Oncology 2009;5:A155.
. Thinking differently about the Cancer workforce. 2016. http://www.nuffieldtrust.org.uk/blog/thinking-differently-about-cancer-workforce (accessed 24 Mar 2017).
. Education, Training, and Support Programs for Caregivers of Individuals with Cancer. In: Talley RC , McCorkle R , Baile WF , eds. Cancer caregiving in the United States: research, Practice, Policy: rosalynn Carter Institute for Caregiving Caregiving: research-practice-policy series. springer: New York and Heidelberg, 2012:79–102. Contributors JB, GL, PG and TW were responsible for the systematic review design. GL was responsible for data collection. JB, GL and PG were responsible for data extraction and appraising studies. JB, GL, PG and TW were responsible for data analysis and interpretation. All authors contributed in drafting the manuscript. JB is responsible for the overall content as the corresponding author. Funding This work was funded by Macmillan Cancer Support to support the work of the Expert Reference Group for the Older Person with Cancer. The views expressed are those of the authors and do not necessarily reflect those of Macmillan Cancer Support.